Keep those "no rules" entries coming for this week's challenge - we're loving what you came up with and all the variety of projects that we are seeing! I'd like to thank everyone who took part in the challenge. It is always a joy to see what you create. 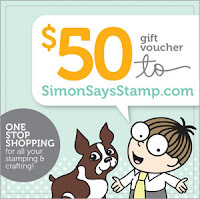 I'd also like to say thank you to Simon Says Stamp for their generosity - each week we give away a $50 gift voucher to the shop that you can use to buy all kinds of fabulous stamps, inks, and paper crafting supplies. Remember - you just need to enter the challenge each week to be entered into the draw! Congrats everyone..lovely creations and great layers. Thank you for selecting my card as a Top 3! Muchly appreciated! Congrats to Gillian and Coconut, and Cathy R. Awesome creations! Fabulous entries by all who participated!